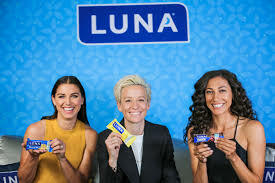 April 3 – On Equal Pay day in the United States, the national women’s team received a financial boost through a pledge from LUNA Bar to pay each member of the World Cup squad a bonus to equal that of their male counterparts. On Tuesday the nutrition brand aimed at women announced that it will pay each member of this summer’s USWNT at the 2019 Women’s World Cup in France a bonus of $31,250 for making the final squad, which will be revealed in the next few weeks. LUNA said the decision to cover the disparity was taken now rather than to wait for the outcome of the ongoing litigation. In March Alex Morgan (pictured right) and Megan Rapinoe (pictured centre) were among a group of USWNT players who filed a collective lawsuit against US Soccer in the US District Court for the Central District of California. They argued that the wide disparities in pay between the women’s and the men’s national teams were not a result of market forces. The players went to court to act on what they believe is long-standing inaction from their federation while they outperform the men’s national team. The USWNT is the most successful team in women’s football history, winning the World Cup three times and the Olympic Games four times. US men’s players will get $55,000 for making the World Cup whereas women’s players only get $15,000. The USWNT get a modest bonus of $1,350 for winning a game and they receive nothing at all they lose a match. The World Cup bonuses itself differ hugely: the men’s team received $9 million for reaching the round of 16 at the 2014 World Cup in Brazil whereas the women’s team were given a meagre $2 million for winning the 2015 Women’s World Cup in Canada. “We were blown away, because often the lens that we see the fight for equal pay is not a fun or pretty or celebratory one,” said USWNT striker Christen Press (pictured right). “It’s a fight. It’s tiring, so it’s kind of a second job off the field. In 2016 five USWNT players, including former goalkeeper Hope Solo, had similarly filed a complaint which alleged wage discrimination by the US Soccer Federation.